Excellent opportunity for someone who wants to own their own business. Turnkey Franchise Business operating & established almost 6 years. Lots of potential for growth. The store has shown a 68% year to date growth rate as per The Galvanized Gazette. Business Only, No Real Estate. Price includes inventory, equipment, truck, forklift, band saw, plate saw, shears, racking system. Well laid out set up to facilitate the process of cutting and distributing metal. 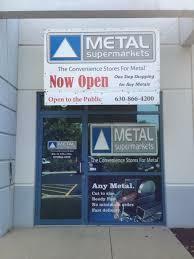 This is a one stop shopping for any length, shape and size metal requirement, cut and delivered. Seller is retiring and relocating, but will assist in the transition and training of new owners. Listing provided courtesy of Shirin Marvi Real Estate.